Low back pain can be caused by various causes that may be located within the spinal column or outside the spinal column. Causes outside the spinal column include pancreatitis, pelvic inflammatory disease, intraabdominal or pelvic tumors, and peripheral neuropathy. Causes related to the spinal column include postural causes, osteoporosis, degenerative spinal instability, spinal tuberculosis, inflammatory spondylitis such as ankylosing spondylitis, vertebral tumors, intradural tumors, tethered cord syndrome, fatigue pains in spinal deformities. How does the doctor diagnose the exact cause of low back pain? An accurate history is the most important diagnostic tool. The way the pain started and progressed; specific aggravating and relieving factors of pain; distribution of pain over your body, associated complaints such as weakness or numbness over the lower limbs will be a guide to short listing the possible causes of your low back pain. A detailed clinical examination by the best spine specialist involves assessment of spinal motion, assessment of your neurology and certain special tests will allow to further narrow down the causes to 2-3 most probable ones. Though this process of history-taking and clinical examination may appear boring and long-drawn, it is the most crucial part towards prescribing the correct treatment to you by the best spine consultant. So, it is essential to cooperate with your spine specialist doctor throughout this entire procedure, which gives more information to the doctor regarding your ailment than any other investigation on earth. What are the investigations routinely ordered in low back pain? On the first visitto the best spine surgeon or consultant, if your problem is short-lived and there are no major signs or symptoms, you may not need any further investigation. However, if your problem has been present for some time, or if there is some history of trauma, fever, any other major illness, or any unusual findings on clinical examination; you are likely to require some further investigations. Commonly, plain x-rays of the spine may be ordered by your spine consultant with or without some basic blood investigations such as hemoglobin, erythrocyte sedimentation rate [ESR], CRP, RA test, serum calcium, phosphorus and alkaline phosphatase. Based on these tests, or sometimes, in the presence of some very significant signs or symptoms, you may be asked to undergo MRI scanning. Plain x-rays demonstrate bony features; while MRI demonstrates the spinal cord, its nerve roots, the intervertebral disc between the two bones of the spine. Both these tests are complimentary in nature; doing one does not necessarily mean that the other one is not needed. In some cases such as peripheral neuropathy, additional investigation in the form of EMG-NCV test, to assess the function of each of the various nerves in your limbs may be required. Rarely, a nuclear bone scan may be asked for. Can this condition be treated without surgery? The treatment would naturally depend on the exact cause of your low back pain. As far as postural and chronic mechanical low back pain is concerned, it can generally be treated without surgery. Various nonoperative means of treatment include bed rest, painkillers, muscle relaxants, various modalities such as heat and electrical stimulation, activity restrictions, etc. During the acute period of back pain, complete bed rest is helpful. If you sprain one ankle, you can hop on the other one and still continue to walk. But you have only one spine!! So, the only way to give rest to it is to go to bed! Among all the positions; sleeping, sitting, standing and walking, the load on the spine is least in the sleeping position. How should you sleep? You should sleep on your side, either right or left, whichever is comfortable, with a pillow in between your legs. What kind of bed should you sleep on? A cotton mattress is ideal! No need to sleep on hard beds, nor do you need to fall for any kind of so-called “spine-friendly” expensive mattresses sold out in the market! This bed rest should be for a period of 2-3 days. During this period, you should eat, drink and sleep in the bed. Only sponge bath is allowed. Ideally, you should not get up even to visit the washroom; you should use a bedpan or urine-pot. However, if this is too much of an inconvenience, you may be allowed to get up to use the washroom alone. How long should you take bed rest? If the pain has to respond to bed rest, it will do so within 2-3 days; continuing beyond this much time only further weakens your spinal muscles without really decreasing your pain; in other words, beyond 2-3 days, complete bed rest will do more harm than good to your back. Painkillers will be prescribed by your spine specialist to allow a smoother and easier return to normal function. You would generally be prescribed these on a shorter term or on a longer-term tapering program so as to guard against possible over dependence on these agents, as these are associated with significant side effects if used excessively in the long term. These side effects may range from hyperacidity, gastric ulcer, kidney damage, bleeding disorders, constipation, addiction, etc. In addition, based on individual merit, you may also be prescribed muscle relaxants so as to relax and soothe your back muscles. Based on the cause of your low back pain the best spine surgeon may prescribed steroids, antibiotics, calcium and Vitamin D supplements, etc. Physiotherapy modalities may be used. This consists broadly of passive and active physiotherapy. During acute pain, generally, only passive physiotherapy would be used. This would be in the form of heat in various forms or electrical stimulation in various forms. Simplest form of this therapy is the “grandmother’s hot water bag”, a simple home remedy. Since complete bed rest has a more scientific role in relieving your back pain, in the acute phase of your back pain, it would not be recommended for you to travel every day from home to the hospital for purposes of physiotherapy; unless of course, if you are admitted into the hospital for complete bed rest! Though complete bed rest would be prescribed only for 2-3 days, you would need to have some activity restrictions to help your spine get back into shape and stay that way!! You would not be allowed to bend forwards; sit on the floor; lift weights; use the Indian type of commode [toilet-chairs are available on rental basis as well as on sale in many medical shops]; travel [particularly not on 2 and 3 wheelers]; and smoke. These restrictions would be generally enforced for a minimum period of about one month. Smoking would be forbidden lifelong! When and what is the nature of surgery, if necessary? 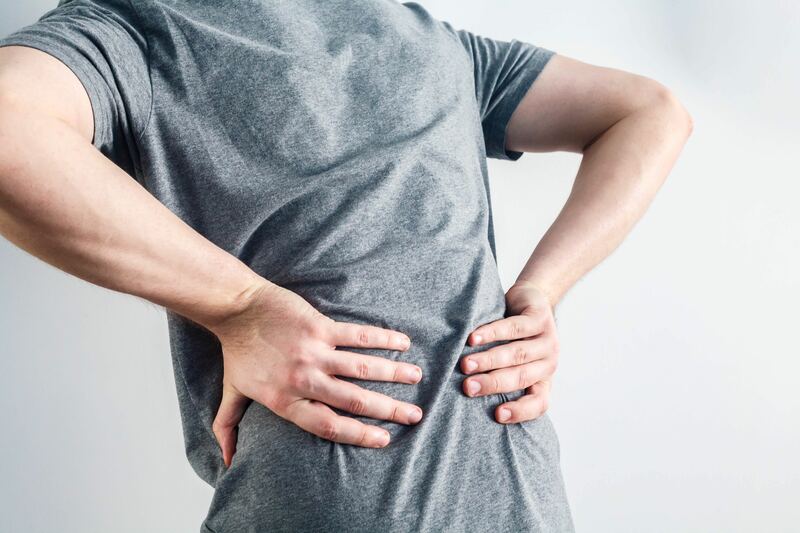 If the above-mentioned nonoperative treatment fails to give good relief after a period of at least about a month, you are likely to require surgical intervention for permanent relief of your low back pain. Notable exceptions to this very simplistic statement include the possibility of infection, significant injury, malignancy, intradural pathology and spinal deformities. The surgery would aim to correct or control the underlying disease. Most surgeries for pure back pain without lower limb pain would be of two broad categories; the first one would involve replacement of the damaged intervertebral disks [the “shock-absorbers” of the spine] and the second one would involve some form of stabilization. What does this mean? The spine is made up of multiple individual bones joined together by various ligaments and joints. This facility has been provided by nature so as to allow smooth movement of the spine; however, when the spine begins to move abnormally, it is termed as having become “unstable”! Surgical intervention aims at either replacing the damaged disk with an artificial disk and thereby correcting the abnormal motion or by abolishing the abnormal motion altogether by fixing it with rods and screws. The first type of surgery is generally offered to patients with sedentary lifestyle and the second type of surgery is generally offered to patients with high functional demands on the spine. These artificial disks, rods and screws are made of body-friendly metal and would not generally need to be removed at any later date as the body tolerates these well even if left lifelong! Are there any risks associated with this form of surgery? Rather than asking yourself this question, it is essential to ask the question as to what are the risks of doing the surgery versus not doing the surgery? Only if the risks of doing the surgery outweigh the risks of not doing the surgery; only if the benefits of surgery outweigh the risks of surgery in a significant way, would you be recommended surgery! Discuss the details of your surgery and its attendant risks with Spine Consultant to quell any fears and to clear any and every doubt of yours! If you so desire, your best Spine consultant or specialist can even arrange to give you references of patients who have undergone similar surgeries. Can I do something to prevent the recurrence of low back pain? Your spine is made up of multiple bones stacked one on top of another, like a pile of bricks! If you tap on the top of this pile of bricks, everything is going to come crashing down! The analogy here is that the spine is inherently a very unstable structure. The muscles that surround it provide its stability. So, your exercises would aim at strengthening these muscles. It is not just the strength of individual muscle that is important; it is important to have good coordination among these as well. If one side is pulling, the other side has to relax. Based on your pain pattern, the exact muscles that need to be strengthened and coordinated would be identified and you would be started on appropriate exercises. These exercises are not advisable during the acute phase of pain as they may aggravate the pain in most of the instances. Among all the positions; sleeping, sitting, standing and walking, the load on the spine is highest in the sitting position, as the weight of the body is directly transmitted to the spine. So, it is not advisable to sit for prolonged time. If you have a job on hand that demands continuous sitting for 6-7 hours, sit for 15-20 minutes and then get up and walk around for about 5 minutes. This will give you as well as your spine a much-needed break! Also, due to the same reason, sitting on a 2-wheeler or a 3-wheeler or any 4-wheeler with poor shock absorbers [such as a jeep], is likely to cause significant jerks and jolts to your spine. So, for a healthy spine, stay away from these! Additionally, prefer to sit on a chair with comfortable armrests; this would help in facilitating a good part of the body weight to be transmitted through the upper limbs, giving a much-needed respite to your spine. Your chair should have a backrest. It is advisable to have an anatomically contoured backrest so as to conform to the hollow that is present in your lower back. If this is not so, then you can use a small pillow as a filler for the hollow of your lower back. Always sit in a comfortable upright position, neither should you slouch nor should you pull yourself up in a military position. Having a big protuberant stomach shifts the weight-bearing axis to the front of the lower spine, leading to back pain. So, watch your paunch and your body weight! What is the ideal exercise for weight reduction for spine patients? Brisk long walk for an hour everyday! This walk has to be brisk, not a casual stroll! Contact the best Spine consultant in Bangalore, India for all kinds of spinal ailment.